Lighting in the home is typically something we take for granted until we find ourselves struggling to do a task, like following a recipe in a book or reading a magazine. In order to ensure that our home provides us with adequate levels of lighting, there are a number of important factors we must take into consideration. 1. How much natural light is in the room? 2. What activities are going to take place in the room? 3. What type of mood or atmosphere do you want to create in that particular room (if any)? 4. Do you have any decorative art or other element(s) that you would like to highlight or display in the room? Of these questions, the second is by far the most important, as any natural light would obviously become irrelevant at night. Room activities become the critical factor for consideration, and can vary greatly from room to room. 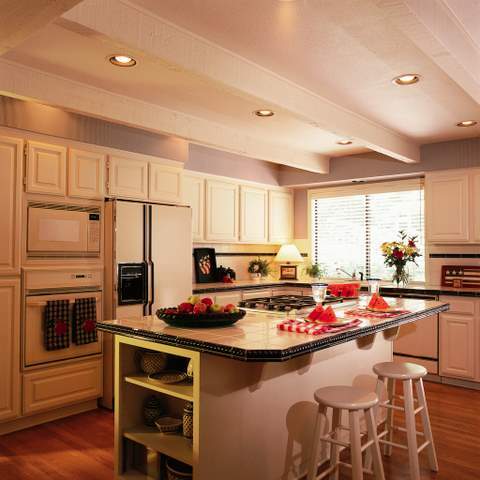 Areas of high activity, such as a kitchen, will obviously require more light than a closet or pantry. This type of lighting is fundamental to any lighting plan. It is a basic form of lighting that is intended to replace sunlight. You can see and walk about safely, with an overall illumination that provides a comfortable level of brightness. Task lighting is designed to help you comfortably perform specific tasks, like reading, sewing, cooking, etc. This type of lighting should be free from shadows or glare and bright enough to prevent any eyestrain as you perform specific tasks. Task lighting is also typically a focused form of lighting, with its location specific to the locale where the task is performed. Accent lighting is used to highlight and draw attention to artwork, pictures, plants, architectural elements, etc. in a room. The intent is to create or add drama to a room by drawing attention to specific characteristics. Typically track, wall mounted or recessed lighting is used for this purpose. A fourth type of lighting is decorative. In this situation, the light fixture itself becomes the focal point, rather than the type of lighting it provides. It can still serve as a provider of one of the three main types of lighting, but the lighting aspect is secondary to the visual element of the fixture itself. Years ago, the standard electrical blueprint called for lighting strictly to code. In that ‘minimalist’ situation, you’d often find rooms wired for a single source of light. Thankfully those days are gone. Today’s builders and designers are more cognizant of the need to “layer” lighting in a home. Layering of lighting involves utilizing a variety of light sources to accommodate more than just one function. 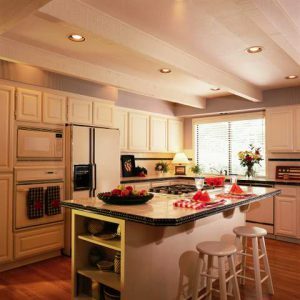 An example of this would be the use of a fluorescent cloud fixture in the kitchen to provide overall ambient lighting, and adding under counter lighting to serve as task lighting. The use of more than one type of lighting, and incorporating the layering of lighting, will make the lighting in your home more effective, more functional, and add a decorative element to each room. This entry was posted in Home Lighting, Lighting and tagged accent lighting, ambient lighting, decorative lighting, home lighting, lighting, lighting design, task lighting. Bookmark the permalink.